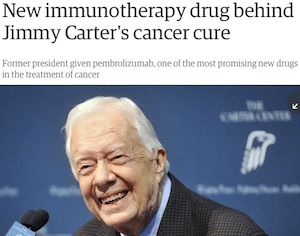 Immunotherapy drugs that stimulate the immune system to fight cancer are a hot news topic, buoyed in part by high-profile apparent success stories like that of U.S. President Jimmy Carter who was diagnosed last year with metastatic melanoma. 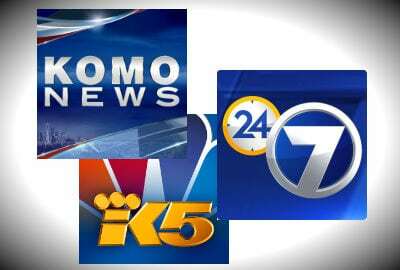 We always advocate for costs to be included in news stories looking at health interventions. This is especially important for pricey checkpoint inhibitors like Keytruda, the drug Carter used. As we point out in our review of a Reuters story looking at trial results for Opdivo, another checkpoint inhibitor, a year’s worth of treatment costs about $250,000. Even with insurance, the out-of-pocket costs for these drugs are sending some patients into bankruptcy. The pricetag alone is a staggering detail that readers deserve to know. And so are the fascinating unintended consequences that impact all of us. And what about when drugs are still experimental? The Washington Post handled this well in a recent story about a t-cell immunotherapy for kids, as we note in our review of their story, because they give a cost estimate based on similar drugs already available. In cancer trials, many studies rely on what are known as “surrogate endpoints” to measure the success of a treatment, instead of primary endpoints like overall survival rates, which require a big, long trial to reach statistically significant findings. It varies, but these surrogates usually include how long the treatment kept the cancer from spreading (“progression-free survival”), or how much it shrunk or reduced tumors (“objective response rate”). For journalists, what matters here is that you explain how positive results related to surrogate endpoints are no guarantee of a longer, healthier life compared to standard treatment (see this chart for a very easy-to-understand explanation). “Surrogate markers such as PFS and ORR are valuable in drug development; however, their utility and need for longer follow up need to be acknowledged,” said oncology researcher Mike Thompson, MD, PhD, of Aurora Healthcare in Milwaukee. This means if you are writing about a surrogate endpoint like tumor shrinkage, be specific and use actual numbers. And, as we discuss in our review of a Boston Globe story about a modified herpes virus treatment for cancer: Remind readers that surrogates often don’t tell the whole story. 3. Ask: Does this drug extend life? Improve quality of life? Lack of evidence around survival benefits is far more widespread than just the drug written about in the Globe piece. As a Milwaukee Journal Sentinel/MedPage Today analysis found, of 54 new cancer drugs approved in the last decade, “the FDA allowed 74% of them on the market without proof that they extended life. Seldom was there proof of improved quality of life, either.” When extended survival was shown, their analysis found it usually only amounted to a just a few extra weeks or even days. In the above example from the Boston Globe, the FDA disclosed that the drug had not been shown to improve overall survival. But, often news releases from the FDA, drug industry and medical research centers don’t clearly explain what the limitations were, as we saw in our news release review on the drug Tecentriq. In this case, the FDA news release notes that a Tecentriq trial measured tumor shrinkage as the main outcome. Survival isn’t addressed. Yet–and our hats off to them for doing so–the New York Times wrote about Tecentriq and wisely pointed out that it is unknown whether the treatment makes a difference in survival. The oncologist goes deep with publisher Gary Schwitzer on many of these issues, from surrogate endpoints to the flailing promise of precision oncology. Take a listen here. Immunotherapy drugs are often described as “lifesavers” and “game changers.” A recent Pittsburgh Post-Gazette story described how the side effects may even “pale” in comparison to chemotherapy. And for some people, that’s true. But the reality is these drugs have severe side effects, and can produce disabling conditions, including severe colitis and widespread arthritis. 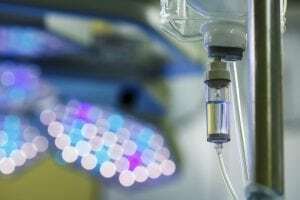 “These are treatments that have toxicities, and they may be different (and in some cases worse) than the toxicities from standard chemotherapy,” said Deanna Attai, a breast surgeon and assistant clinical professor of surgery at the David Geffen School of Medicine. Also important to know is that our understanding of immunotherapy’s full impact is still unfolding, something hinted at in this Medpage Today story about the “novel” emergence of inflammatory arthritis among immunotherapy patients at a cancer center affiliated with Johns Hopkins. Immunotherapy should not be confused with precision oncology, which is the notion that genetic sequencing can reveal mutations that help optimize treatment. Instead of focusing on the type of cancer (lung or breast or colon, for example), treatment is targeted based on the type of genetic mutation seen. In some cases, an immunotherapy drug might be used, but mostly it involves other types of cancer drugs. 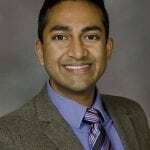 What immunotherapy and precision oncology have in common is a lot of hype over relatively lackluster results, notes Dr. Vinay Prasad, a hematologist-oncologist and Assistant Professor of Medicine at the Oregon Health and Sciences University, who wrote about the “precision-oncology illusion” in Nature. And, even in the rare cases where a drug is found to be a good match for the patient’s biological markers, this doesn’t guarantee blockbuster results. Prasad reports that only about 30% of these patients see any improvement. “At best, we may expect short-lived responses in a tiny fraction of patients, with the inevitable toxicity of targeted therapies and inflated cost that this approach guarantees,” he says in the Nature review. And yet, even though they do not represent the typical scenario, it’s this “tiny fraction” of patients who have exceptional results– from immunotherapy or precision oncology treatments–who often make their way into news stories, Prasad says. “In reality, many people profiled are unusual before they took the drug: They already lived far beyond expectations,” Prasad said. Before the super-responder patient got the “new” drug, had their course been average? Or were they already beyond average? Did they respond wonderfully to early therapy? Did they already outlive life expectancy? What was the best response to therapy (did the cancer shrink or just grow slower)? Bottom line: There is understandable excitement surrounding these drugs that extend life for some patients who’ve run out of options. But as journalists, we have a responsibility to not let this enthusiasm run beyond what the evidence can support–what Prasad calls fostering false optimism. Patients live in a sea of medical industry HYPE today. Big Pharma hypes it’s products, hospitals hype their transplant centers even when there are better options than transplants. There will come a time when transplants will continue to be promoted even when transplant becomes the inferior choice because transplants are ca$h cow$ for ho$pitals. Human pride exaggerates new techniques and procedures. Profit motive puts sales and marketing ahead of patient well-being. Thank you for an objective story about cancer treatments! We appreciate hearing the truth, not the hype. This is a very good description of the realities of how confusing the healthcare world and cancer therapy can be. I do believe patients have so much anxiety about cancer treatments and seek the latest ‘miracle’ treatment. Immunotherapy is very helpful, but as indicated by this entry, there are so many other questions patients need to be asking. Unfortunately, the healthcare industry is also profit driven and this means many consumers could be swayed by regimens that are promoted as the most effective strategy. 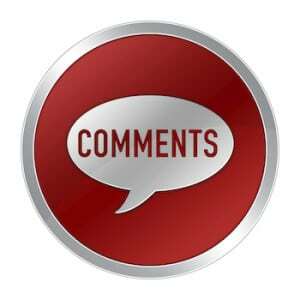 This blog entry and posting is a very good start to help consumers think before reacting. Thanks for posting this. Thanks for covering this important topic. Some of these excellent recommendations might be applied to drug labels and ads.